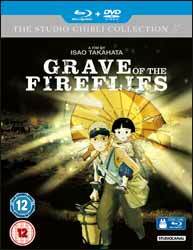 Grave of the Fireflies (1988 - 1 hr, 30 min, 25 sec) is an animated film, directed by Isao Takahata, who also adapted Akiyuki Nosaka’s book for the screenplay. Takahata has said on many occasions that Grave is not an anti-war film, but its tone and narrative can only create sympathy for the millions of ordinary citizen which were caught up in World War Two. The film opens with fourteen year old Seita dying of malnutrition, his only possession is a candy box containing ashes, and even this is casually discarded by a caretaker. The story which follows is told in one long flashback, from Seita’s point of view. If the film had been unrelentingly bleak it would have lost some of its power, Takahata shows that even through their slow decline into hunger and death, the brother and sister still are able to have days when they have fun. The biggest problem the children encounter is not the mean aunt, but their divorce from the society which surrounds them and any help which it may have offered. Alone, struggling to survive, neither have the tools to live independently. Without a support system, the children are doomed as soon as they decided to move out of their aunt’s house, which cuts them off from the ration system. Even the money which Seita gets out of his mother’s bank account is no good to them, as there is nothing to buy. Animated films are often looked down on as entertainment, even when their skill is being acknowledged. Graves proves that an animation has the power to move its audience with its ability to portray a real tragedy. I did have a problem with the almost universal callousness which greets the two children at every turn. The war has turned people inward, trying their selves to survive every day, the audience may have sympathy for the siblings, but their neighbours do not. Of, course the art alone is not enough to provide a moving experience and both the original Japanese audio track and the new English dub both do a great job of bringing out the pathos in the story. I would defy anybody not to get to the end of the film without a tear in their eyes. The film looks crisp with its new Blu-ray release. The film is presented with an anamorphic aspect ratio of 16:9, both language tracks are Stereo 2.0 LPCM, with an English subtitle. Like most Ghibli films, you can watch the whole thing with the original storyboards. The extras are essentially the same as the two disc DVD set, including an Interview with director Isao Takahata (17 min, 39 sec - 4:3) talking about his approach to the film and how it came to be made. The Japanese release Promo (6 min, 36 sec - 4:3) has contributions from both the director and original writer Akiyuki Nosaka, who was pleased with the final result. The Historical Perspective Documentary (12 min, 25 sec) looks at the use of weapons against the civil populations and how Japan reacted to this. There is an Interview with Roger Ebert (12 min, 07 sec) discussing why he holds Grave in such high esteem. The disc wraps with Deleted Scene, Storyboards, Bonus Storyboards and Trailer. Undoubtedly a powerful film, Graves takes its audience on an unforgettable emotional journey into the life and sad demise of these two children of war.